A vegan restaurant in the heart of Victoria Street in Richmond? With all the Vietnamese restaurants you'd wonder how it would survive. Loving Hut is truly a testament to vegan food. With an extensive menu ranging from entrees to desserts - this is one not to be missed, even if you aren't vegan! 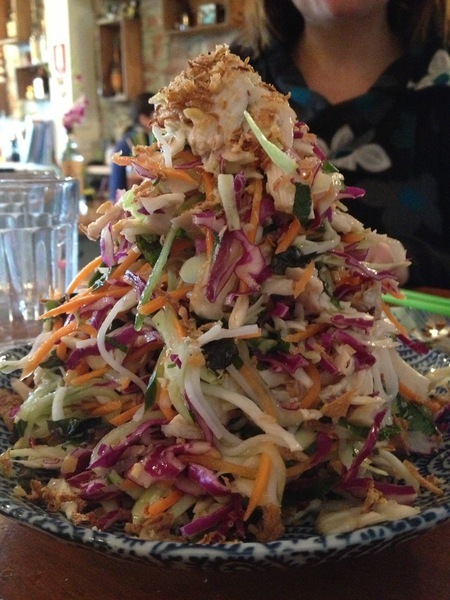 Amongst five other dishes, I had the coleslaw style salad and it was fresh, bursting with flavour, vibrant and super healthy. The colour alone is enough to visually stimulate your appetite. A mix of thin rice noodles, shredded red cabbage, carrot, cucumber, cabbage, onion, coriander and Vietnamese basil was tossed in a light Asian style dressing. Perfect if you are feeling low on your veggie intake and looking for a new spring dish. Insider tip: Have dessert. Really. Their dessert menu is an absolute treat. I had the chocolate cheesecake. It's hard to believe it is vegan and the chef made it from scratch. Loving Hut is located at 10/242 Victoria Street, Richmond.